After months of hard work, bland lunches and endless anxiety, last week I finally finished my personal project: Modern Tastemakers. This project is my take on the importance of modern record label in the middle of digital inundation and self curation. 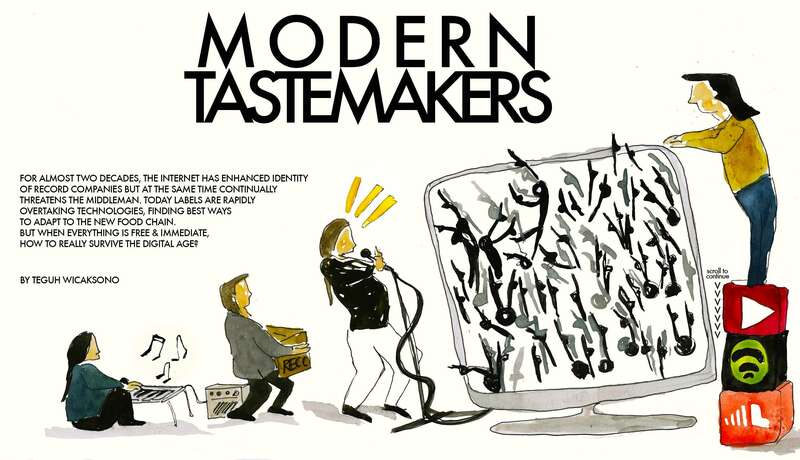 Modern Tastemakers consists of four parts: the first is about the necessity of record label in the industry, the second is about false complacency from bands in the digital age, triggered by numbers on the Internet. The third part discusses about how sending demo tapes is becoming more obsolete as way to reach the labels. And the final part is a bigger view of industry, entwined with the streaming culture. Modern Tastemakers undertakes multimedia approach to connect with readers, meaning that it offers not only texts and photos, but also audio, video and data visualisations. For you music enthusiasts, Modern Tastemakers could reveal couple of important things about surviving in the digital age, plus some insight about the business, what labels really seek from new talents. For more general readers, Modern Tastemakers vessels a lot of information about the music industry and the digital conception.